Pretty often we need transportation. In this post we offer you to think about Silvercar by Audi service – an amazing car rental service. Silvercar by Audi is the airport car rental experience re-imagined. Designed especially for the connected business traveler and wonderers. Silvercar by Audi delivers a fast, frictionless, consistent experience, featuring a single, premium car model every time – the Audi A4. By using a smartphone to sign up, reserve, and select and unlock the car, Silvercar by Audi customers get on the road without delay. The return is just as streamlined and features easy drop-off and instant e-receipts. There are no lines, no counters, no hassles, and no upsells, and our friendly, experienced concierges are always nearby to assist as needed. 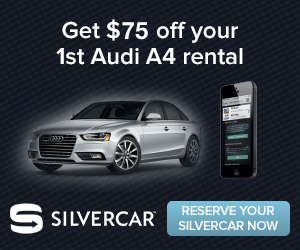 There’s a special Silvercar by Audi promo code to get you 1 day free rental of at least 2-day rental for first time Silvercar users, and Silvercar offers $25 to first-time renters who are referred by existing customers. Sign-up to Silvercar by Audi. …and minus $25 with referral code of DDUDARENKO by e-mail, when you will finish your reservation, which marks down price to $53.94 for 2 day-car rent of incredible Audi A4 for 2 days! If you’ decide skip refueling to save time and hassle on your return, you’ll be billed at the current local premium fuel rate for exactly what you use, plus a simple $9.95 fill-up fee. No whole-tank pre-pays, and no exaggerated per-gallon markups. Image Credits:Photo by Andraz Lazic on Unsplash.